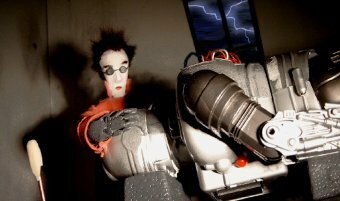 As a mad scientist brings a robotic creature to life, his laboratory machinery short circuits. He dies in a big bang, leaving the new born on its own. Faced with life, the robot tried to find its purpose in the remains of the lab and turns to the only familiar object: a computer. Steffen Blechschmidt was born in 1979 in Magdeburg. After an internship and working as a production and director's assistant and an editor, he took up studies in Design at the Hochschule Anhalt in Dessau and participated in an exchange semester at the Cleveland Institute of Art. His films include: Zahnschmerzen (2001), The Child (Das Kind, 2003), and the music video Sternmobil for the band Apes in Space.